As a doctor who specializes in diseases like diabetes, I know a bit about nutrition and metabolism. I really believe in the old saw or saying “You are what you eat.” That is, the amount and types of different foods really affects not only our weight, but our general health. Food is a complicated mixture of energy sources (calories), protein (to make new tissues like muscle and skin and heal wounds), and micronutrients like vitamins to support a wide range of biochemical processes. It is pretty well understood that when our diets are imbalanced, different functions in our bodies may suffer. Taking in too little or too much of something can cause diseases; there are lots of examples that have filled textbooks. People who are deficient in vitamin D, for example, suffer from bone problems and weakness; too much vitamin D may have high calcium in their blood, kidney stones, and possibly liver problems. The key to a successful diet (and nutritional health) is balance and moderation of good quality food. 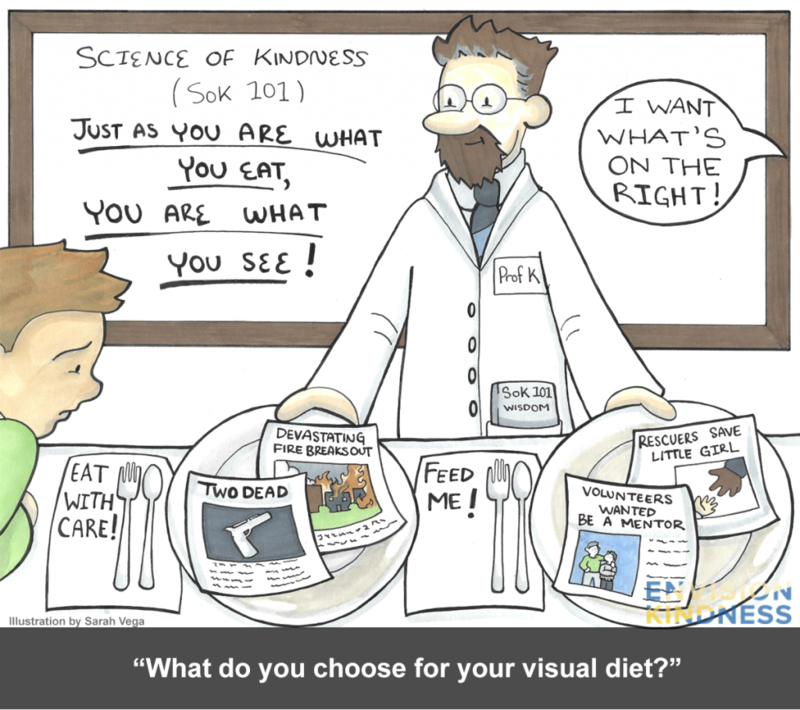 Years ago when I realized that I was “ingesting” way too much negative news , I began to think about my “visual diet” and wondered what the research literature had to say about it. The analytic side of my brain was fascinated to find out that a few short minutes of exposure to negative news can induce anxiety, stress, and symptoms of depression. for a substantial fraction of people. Wendy Johnston and Graham Davey showed that a 14-minute video of negative TV news (not even internet-delivered news) can rapidly increase anxiety and sadness . What’s particularly noteworthy is that beyond induction of anxiety and sadness, watching negative news spilled over to their own personal worries and amplified them. That is, the participants of the study who saw negative news (in contrast to positive or neutral films), expressed greater anxiety related to personal issues. A preliminary report from Michelle Gielan, Shawn Achor, and collaborators at the Huffington Post suggested that the effects of negative news exposure can last hours into the day for a substantial fraction of people. So depressing and fear-inducing news can make people feel more sad and anxious, which, in turn, can magnify their own problems and can last for quite some time. Wow. A difficult, negative emotional cycle that can be self-reinforcing. That is, someone gets depressed and/or stressed by the news. Their emotional and mental state affects interpersonal behavior which then reinforces assumptions about the world. This is huge and consistent with what I was experiencing. How about “positive” news or stories? The few studies that exist suggest that inspiring, positive media have opposite effects from negative media. Algoe and Haidt found that viewing a short (~4 min) video of a young man who established a homeless shelter in Philadelphia was specifically able to induce gratitude and love in contrast to videos that inspire admiration or were just funny . Schnall and colleagues showed volunteers a video from the Oprah Winfrey show in which a musician pays tribute to his former music teacher. The teacher had saved the young musician from a life of gang activity and violence. Seeing that 7-minute video significantly increased the willingness of the participants to volunteer compared to an amusing video . Other studies of this kind . showed that viewing uplifting videos may have positive or desirable effects on sexual prejudice as well as stimulating mothers to nurse. All of this research led me to coining the phrase “Just as you are what you eat, you are what see.” The word “diet”, in fact (and I only recently learned), does not just refer to what food we eat. It comes from the Greek meaning for “way of life” or how one lives his or her life. With that broadened definition the word “diet” had greater meaning as to all of the things that we absorb–food, stories, images, sounds (music)–and how they impact us. unhealthy can really change how we think and behave. We need a balanced visual diet. As much as we may think that our personalities are stable, just like eating food that is bad for us can change our bodies, taking in images and stories that are unhealthy can really change how we think and behave. I should be clear that this does not mean to ignore the negative news. There are important things to learn about to help us understand what others are going through and to help fix the problems. It really means that we need a balanced visual diet—one that nourishes the soul and yet motivates us to action to make things better. In the next blog, will explore how images of kindness specifically affect people. There is a lot of cool stuff here. Psychologists use the terms negative and positive to describe some emotions or triggers that evoke those emotions. Negative news or stories refer to stories of death, destruction, greed, natural disaster, etc. Positive news would be people helping each other; someone surviving a difficult surgery or an accident; people volunteering to save a town from a flooding river.